Enjoy height and tilt adjustability - and the ergonomic benefits that come with it - for less than other 3M Premium keyboard trays. Compatible with ergonomic keyboards. 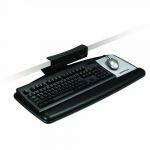 For corner or straight-on workstations that can accept a 21" track. -Convenient lever-arm adjustment: Flip the lever to adjust height and pull the tab to adjust tilt. -Gel wrist rest for keyboard and mouse add comfort by minimizing pressure points. 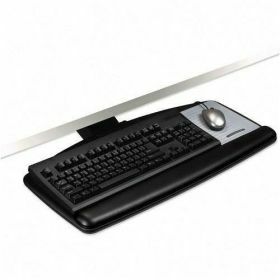 Leatherette cover lasts longer than fabric-covered wrist rests and is easier to clean. 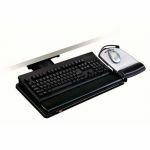 -Single platform accommodates both keyboard and mouse. 3M™ Precise™ Optical Mousing Surface can be positioned to the left or right of the keyboard.